Have you heard the news? 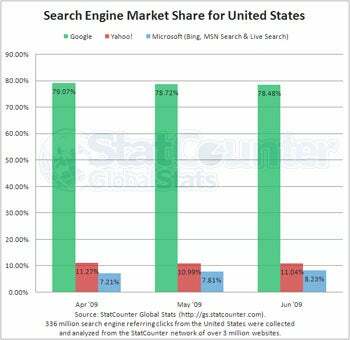 Microsoft's Bing is taking a bite out of Google, boasting first-month market share gains while the competition's stronghold slips away! At least, that's what some headlines around the Web might lead you to believe this week. The truth, though, is that the change is not nearly as dramatic as it appears at a glance. While Bing has, according to certain data, minimally increased Microsoft's search market share, Google's position has not significantly shifted. All the buzz comes from a new search market analysis by Web stats company StatCounter. Bing, the researchers say, secured 8.23 percent of all U.S.-based searches for the month of June. (Bing officially launched on June 3.) The previous month, StatCounter shows Microsoft sitting at 7.81 percent of U.S. searches. That amounts to a month-to-month increase of just under half a percentage point following Bing's debut. Google, during that same time span, dropped from 78.72 percent to 78.48 of U.S. searches -- a decrease of 0.24 percent, according to StatCounter's data. Looking back to April, the difference becomes slightly less apt to be obliterated by a sneeze: Google's two-month drop amounts to 0.59 percent, while Microsoft's April-to-June gain comes out to 1.02 percent. The numbers, obviously, are quite small -- but perhaps more important is the fact that zeroing in on such a short period of time makes it difficult to reach any real conclusions. Sticking with StatCounter's data, you'll find that Google's market share has actually fluctuated fairly regularly over the past several months. In March, for example, Google randomly dipped down to 76.49 percent of U.S. searches. Then, it bounced back to 79.08 a month later. Why? Who knows. But it wasn't because of Bing -- that word hadn't even entered our vocabulary as a proper noun at that point. What this appears to indicate is that, whether as a result of shifting usage or margin of error within the measurement, the numbers do bounce around occasionally. Putting too much stock into a minor two-month change, then, seems a bit premature. What's more, early metrics from other analytics companies have suggested Google may have actually seen gains as a result of Bing's arrival. Just a couple of weeks ago, the crew from Compete theorized that users were trying Bing but not abandoning their standard search engines and switching allegiance. In the end, it's simply too soon to call the race; the amounts of change just haven't been significant so far. Bing is far from being out of the running, but it also has yet to complete any awe-inspiring laps. Maybe some projectile vomit-filled ads are what Bing's campaign is missing. Does anyone have the number for Microsoft's IE marketing department?